Not one, but two castles grace the steep and inaccessible hill of Cefnllys which dominates the central plain of Maelienydd around Llandrindod Wells. The main or northern castle was fortified by the young Roger Mortimer of Wigmore (born 1231) on behalf of his father Ralph (c.1185-1246) between 1242 and 1245. The castle then had an apparently peaceful existence until it was taken from Roger's steward, Hywel ap Meurig, a little before 27 November 1262. This was achieved after five years of warfare by a night attack. In the best traditions of stealth the attackers scaled the castle walls and slew the gatekeepers 'by treachery', according to the Welsh Bruts. Hywel and his wife, sons and daughters were then imprisoned and the castle was fired by the victorious rebels of Maelienydd, who were soon re-enforced by an army under the command of Princes Rhys Vychan of Deheubarth and Prince Llywelyn ap Gruffydd's constable. As news of the disaster spread the ancient Brian Brampton of Brampton Bryan castle, already at least sixty years old and with another ten years of campaigning and crusading before him, sensing what was to come, made his will on 27 November and marched out at the side of his lord, Roger Mortimer, for Cefnllys. At the castle the Marcher army came face to face with disaster. Llywelyn had in the meantime come south with his entire host. The startled captains of the March calculated that the Welsh army stood at some 300 heavy cavalry and 30,000 foot. Against them stood only Roger Mortimer and Humphrey Bohun Junior the lord of Brecon with their hastily raised Marcher troops, described in the original sources as 'the flower of the young men of the Marches'. The action proved short and sharp and the Marcher forces were rapidly bottled up in the ruined and unprovisioned walls of Cefnllys castle. Llywelyn did not wait to reduce the defiant Marchers, but, surrounding Cefnllys, pushed on with part of his army taking the homage of Roger's vassals of Maelienydd and attacking Roger's castles with his siege train. On 24 December 1262 King Henry III (1216-72) returning from France landed at Dover and learnt to his distress of Roger's plight and immediately began to organise for his relief, something which the government of England had omitted to do. By 28 December though, the war for northern Radnorshire was over. Roger's castles of Knucklas, Presteigne, Knighton and Norton had surrendered to Llywelyn 'through fear of his siege engines'. Without hope of succour Roger accepted his cousin Llywelyn's offer of a free passage through his lines back to England. Without food or hope of relief the dreadfully thinned Marcher army tramped its frozen path back to Wigmore castle, amongst hypocritical cries of treason from an impotent government that had abandoned Roger and Humphrey's armies to their fate. At Wigmore in his 'compulsive and vehement anger' Roger plotted his vengeance against all concerned. The site of the ruined Cefnllys castle, however, remained in the hands of Llywelyn. By the Treaty of Montgomery on 29 September 1267 it was agreed that Roger Mortimer could re-occupy Maelienydd and rebuild Cefnllys castle on condition that once this was done the right as to who should hold the land should be settled between Roger and Llywelyn. By the end of 1268 Llywelyn had complained to the king that although Roger had rebuilt the castle he had received no justice concerning the ownership of it or the land. In July 1273 or 1274 Llywelyn again pressed his case, this time with Edward I (1272-1307), and additionally complained that Roger had also built a new work on the site, the current southern castle. Llywelyn's deputations brought him no satisfaction and Cefnllys was still a Mortimer castle when Llywelyn was humbled in 1277. In 1282 Roger Mortimer, before his untimely death in October, had a garrison at Cefnllys castle of eight horse and twenty foot. In late 1294 Cefnllys castle again succumbed to the men of Maelienydd who rose in the general rising of Madog ap Llywelyn of Meirionydd, Cynan ap Maredudd of Deheubarth and Morgan ap Maredudd of Gwynllwg. It is possible that the last Brian Brampton of Brampton Bryan fell in this action. No action seems to have occurred at Cefnllys during the fourteenth century, but in 1403 the castles of Cefnllys, Clyro, Painscastle and Radnor were all victualled and armed. Despite this by 1406, it was recorded that Cefnllys castle and the lordships of Knighton and Knucklas (the castles were not mentioned) were 'so burned and wasted by the rebels that no profit could issue to the king without their better custody'. No castles seem to have been rebuilt as a result of this war and only Cefnllys was actually repaired in the 1430's though this too was a ruin by 1588. New research published in The Castles and History of Radnorshire (ISBN 1-899376-82-8) suggests that Cefnllys, Knucklas and Tinboeth castles may have been built by Prince Llywelyn ab Iorwerth in the 1220's. The book includes a detailed history and plans of Cefnllys castle. 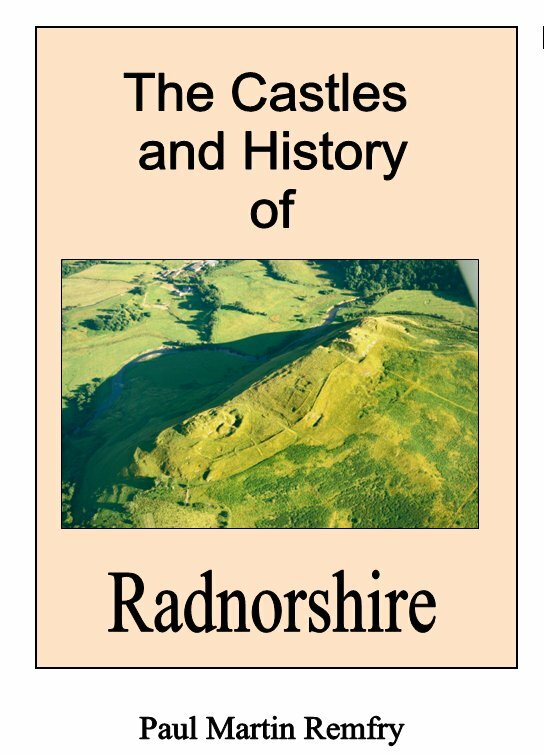 This book consists of 309 pages of A4 and examines in greater detail the history and castles of Radnorshire and Rhwng Gwy a Hafren. Starting in the early eleventh century the book covers the age of the castles up to the Civil War of 1642-46. Each castle description is buttressed by numerous photographs and plans of the earthworks and remains where they survive. A new look is also taken at the battlefield of Pilleth and the evidence for the course of the battle is scrutinised. The book also contains genealogical family trees of the major historical Radnorshire families and a full index. For more information about the Mortimers buy Wigmore Castle Tourist Guide at £19.95 through the PayPal basket below.